A 7-year-old female child was posted for closed reduction of recurrent hip dislocation. Only child born of a non-consanguineous marriage, with insignificant family and antenatal history, delivered at term through normal vaginal delivery. Dislocation of hip first occurred at the age of 2 years and has recurred ever since. She weighed 23 kg, unable to walk, conscious and oriented. She had titubation. Finger tips ulcerations were seen due to repeated episodes of finger chewing [Figure 1]. Thermal injuries were noted in the lower limbs [Figure 2]. The child's development was normal for age. 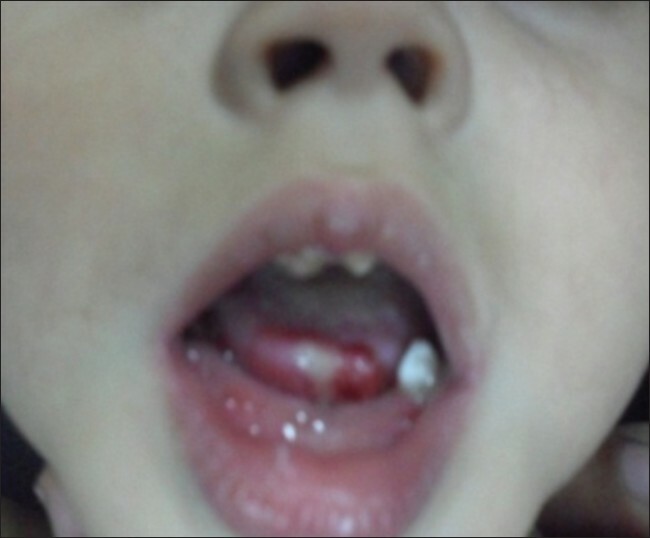 On examination, there were signs of self-mutilation in the form of ulcerations of the lower lip, tongue, and oral mucosa [Figure 3]. Auto-amputations of the finger tips and toes were also noted. On neurological examination, cranial nerve, tone, power, reflexes, and the fundus examination were normal. Sensory examination revealed absent corneal reflex. Response to pinprick was severely limited and there was no response to temperature sensation. No hypopigmented patches or any thickened palpable nerves were seen. Nerve conduction study was normal. Sympathetic skin testing response was absent. Computed tomography (CT) scan was normal, no intracranial bleed. Hematological profile and serum uric acid level were normal. Closed reduction of hip dislocation and prosthodontic treatment were done with counseling of family members regarding risk in relation to the environment in absence of pain constraints and high incidence of self-abusive behavior. No specific therapy is available. Treatment depends on the patient's age and intelligence, as well as the parent's attitude and cooperation. The use of a night-guard, grinding sharp edges of the teeth, the addition of a composite, routine dental work (root canal therapy), prosthodontic treatment (crowns), and/or orthodontic treatments can be considered. Prevention of self-mutilation in CIPA patients should involve a team of multidisciplinary physicians as well as a dentist. Conventional radical full mouth teeth extraction should be avoided in CIPA patients and it should be the last alternative therapy. 1. Nagasako EM, Oaklander AL, Dworkin RH. Congenital insensitivity to pain: An update. Pain 2003;101:213-9. 2. Schalka MM, Corrêa MS, Ciamponi AL. Congenital insensitivity-to-pain with anhidrosis (CIPA): A case report with 4-year follow-up. Oral Surg Oral Med Oral Pathol Oral Radiol Endod 2006;101:769-73. 3. Bodzioch M, Lapicka K, Aslanidis C, Kacinski M, Schmitz G. Two novel mutant alleles of the gene encoding neurotrophic tyrosine kinase receptor type 1 (NTRK1) in a patient with congenital insensitivity to pain with anhidrosis: A splice junction mutation in intron 5 and cluster of four mutations in exon 15. Hum Mutat 2001;17:72. 4. Miranda C, Di Virgilio M, Selleri S, Zanotti G, Pagliardini S, Pierotti MA, et al. Novel pathogenic mechanisms of congenital insensitivity to pain with anhidrosis genetic disorder unveiled by functional analysis of neurotrophic tyrosine receptor kinase type 1/nerve growth factor receptor mutations. J Biol Chem 2002;277:6455-62. 5. Safari A, Khaledi AA, Vojdani M. Congenital Insensitivity to Pain with Anhidrosis (CIPA): A Case Report. Iran Red Crescent Med J 2011;13:134-8.